﻿ Best Price on Villas Sur Mer in Negril + Reviews! Located on the cliffs of West End Negril, Villas Sur Mer offers a beautiful outdoor pool surrounded by tropical plants. Each stylish villa has direct access to the surrounding garden. The Sur Mer Villas will provide you with a TV, air conditioning and free WiFi. All villas have a full kitchen with a microwave, stove and fridge. Bathrooms come with a hairdryer. At Villas Sur Mer you will find luggage storage and free parking. Activities in the surrounding area include fishing and diving. 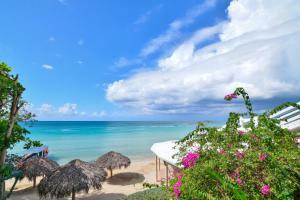 The property is within a 10-minute drive of Negril’s famous 7 Mile Beach and lively bars and restaurants. Montego Bay Airport is located 32 mi from the property.